Under Armour offers a wide variety of colorfully designed shoes tailor made for a variety of sports. However, if Under Armour doesn’t offer a shoe in a deign you like, you can make your own Under Armour shoes to match your team’s color, your favorite color, or your active imagination. When buying a pair of shoes, it’s important to find a pair that comfortably fits your feet and that you will enjoy wearing. Under Armour features a wide variety of shoes in a multitude of style contours and designs. If you don’t like the design of the shoe before you begin to custom the shoe to your particular style, then chances are that you will not like the shoe even after it has been customized. When shopping for a pair of Under Armour shoes, look for a design that you can improve upon when you make your own Under Armour shoe. The more leather on the shoe and the less mesh or netting, the more surface you will have to work with when painting on your design. Before you begin to create your own pair of Under Armour shoes, you need to have a design in mind. You can base your design around a team’s colors, your favorite color, or whatever your imagination can create. Purchasing an all white pair of Under Armour shoes will give you a blank canvas in which to work from, while purchasing a pair with a colored stripe may necessitate incorporating that aspect of the shoe into your design. 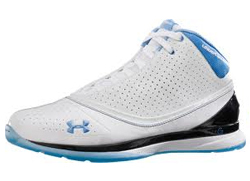 Using a blank sheet of paper, draw or trace the outline of your Under Armour shoes. Once you have your outline, use colored pencils, markers, or crayons to sketch out the design of the shoe. You can make your own Under Armour shoes by painting them by using several different methods. If you want the shoes to be mostly one color, you can try spray painting them. Lay down some newspaper under your shoes to keep the paint off the ground or garage where you are painting. Spray paint should only be used in a well ventilate space, and never in an enclosed room. Cover the parts of the shoe you don’t want painted with tape prior to spray painting the shoes. Arrange the tape in unique ways to add some interesting designs to your shoes. Wait for the paint to dry before removing the tape from the shoes. Another way you can paint your Under Armour shoes is with through the use of paint markers. Paint markers allow you to have a little more control about the different colors you want added to your design. Depending the thickness of the paint in the markers you purchase, you may need to add several different coats to your shoes before the paint is fully absorbed by the leather.